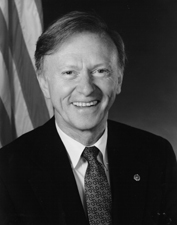 A Senator from Georgia; born in Des Moines, Polk County, Iowa, January 20, 1939; attended Cobb County, Ga. public schools; graduated Lees Summit High School, Lees Summit, Mo. ; attended Georgia State University, Atlanta, Ga., and graduated University of Missouri 1961; served in the United States Army in Okinawa, Taiwan, and Korea 1962-1964; businessman; member, Georgia State Senate 1971-1989; minority leader 1974-1989; chairman, southern steering committee for the 1988 George Bush presidential campaign; director, United States Peace Corps 1989-1991; elected as a Republican in the November 24, 1992, general election runoff to the United States Senate for the term ending January 3, 1999; reelected in 1998, and served until his death due to cerebral hemorrhage on July 18, 2000; remains were cremated. J Ronald Terwilliger Chairman of Trammell Crow Residential, a Dallas real-estate company. Thomas Davis Klingenstein Founder, Managing Director, and Director at Cohen, Klingenstein & Marks Incorporated.